City of Melbourne election 2016 – what do the candidates think of the state of heritage protection in the CBD ? Melbourne Heritage Action has asked all candidates in this election their opinions on a number of heritage issues relevant to the CBD, Southbank and City North, and most of the teams have responded – their replies are shown in italics below each question. Most candidates were generally supportive of heritage as being an important asset in Melbourne, though some individuals are clearly more closely engaged with heritage issues than others. It is always worth reading up in more detail on the policies of various candidates where they are available. MHA notes that the following candidates have a particular focus on heritage issues. The Heritage Agenda is almost wholly focused on heritage issues and how to better protect built heritage in Melbourne, you can see their policies here. The Greens mention their role in securing ‘more heritage protection work’ during their past terms and they address heritage issues in their planning policies here. Gary Morgan and Jackie Watts (Team Morgan) raise heritage protection as an issue (particularly the Vic Market) and have a series of heritage-focused policies here. Phil Cleary doesn’t mention heritage directly but he and his team are very focused on the issues surrounding the Vic Market redevelopment. Together Melbourne, the team behind current Councillor Ken Ong’s bid for Lord Mayor, is generally supportive, but with a few reservations. At the time of publication we have not had a response from Tem Doyle or other candidates. Scroll down to see the responses. We believe that the historic buildings, precincts and laneways of Melbourne’s CBD are a vital element of Melbourne’s character, essence, liveability and desirability. Do you agree ? Melbourne Voice: Yes, they are vital to Melbourne’s identity and global standing, not to mention their place in the hearts of every Melburnian. The City of Melbourne has recently approved heritage studies for new precincts in Guildford lane, and Hardware Lane, a review of Southbank, and a full review of the CBD (which hasn’t been fully reviewed since 1984). Do you support these studies, and approving their recommendations ? The Greens: Greens Councillor Rohan Leppert commissioned all four of these reviews. The Hoddle Grid and Southbank (and Fishermans Bend) reviews were the direct result of Greens motions to commission this work – work that was not otherwise going to be scheduled by the administration. We have already worked to ensure that Melbourne Heritage Action have access to the heritage review process upfront so that ideas for new heritage precincts are comprehensively assessed. We will of course respect the outcomes and push for the full adoption of recommendations. The Heritage Agenda: Not merely do we approve, we would view it as our specific responsibility if elected on a heritage platform to take stewardship of the process. that means ensuring the terms of reference include specific provisions for; listing significant building interiors expanding the city’s inventory of modernist structures adding postmodern structures to the inventory assessing new significant precincts around both guildford and hardware lanes and little lon expanding the city’s inventory of “non-building” structures, including public and private art works, street furniture, horse troughs, memorials, etc we would also undertake to perform the necessary stakeholder management with other councillors to ensure that the recommendations are adopted in full. Melbourne Voice: Yes, we support these studies. We would want to examine further the recommendations without pressure, to determine suitability. These studies will likely include things such as interiors, street objects and public art that havn’t been protected before. Do you agree that these are also worthy ? The Greens: We strongly agree. The Greens ensured, when designing the heritage studies, that interiors, street objects and public art were included in scope. Melbourne Voice: Yes, they are elements fundamental to the overall ambiance. Heritage guidelines for the CBD are currently vague, and a review currently underway will likely result in stricter controls on development to ensure heritage is protected. Would you support such changes? Together Melbourne: Our experience is Heritage controls may appear to be vague, however the process for approving work to heritage buildings in the Melbourne City Council is rigorous and appropriate. We would be supportive of new guidelines that would make the Heritage Guidelines more prescriptive and easier to identify and work with. The Heritage Agenda: Yes, most particularly if this means more prescriptive heritage policies and guidelines. Too much in the planning scheme pertaining to heritage is open to interpretation, particularly as it relates to facadism and degree and nature of mandated retention, mandated setbacks from heritage structures, etc. We favour a return to a far more prescriptive regime. Melbourne Voice: Of course, what of our legacy if we don’t? In recent years, some historic buildings that have missed out on formal protection have been threatened with demolition, and in at least one case actually demolished, namely the 1880s carriage Workshop at 40 La Trobe Street. In that case in 2012, despite an Officer’s report recommending protection, a majority of Councillors refused, not wanting to ‘change the rules midway’. What is your view on protecting individual places when they come under threat ? The Greens: We have a strong track record on seeking emergency heritage controls for buildings under threat. The Greens voted for interim controls at 40 La Trobe Street. This last term of Council, Greens Councillors have sought interim controls as well. It is disappointing that Richard Wynne seems to be continuing the practice of Matthew Guy of ignoring requests from Council for interim heritage protection; this only means that Council needs to move faster to complete the comprehensive heritage studies secured by The Greens. Team Morgan: Heritage considerations like this should not be over-ruled by slavish adherence to bureaucratic procedures: once gone, gone forever! The Heritage Agenda: You cannot have heritage protection full stop without ‘changing the rules’ on someone at some point. Individual sites that have either been recommended for listing by council staff or which have previously received a heritage grading are subject to council’s policy intent that they be protected. Exceptions to that policy intent should not be permitted. This is about the right and duty of council to govern in line with its policies, rather than in line with the interests of a single individual stakeholder. Melbourne Voice: As I mentioned before, what of our legacy if we don’t? Once they’re gone, there is no turning back and so we must protect them. Stephen Mayne: In the case of The Palace we should have joint ventured with the State through the Regent Theatre Management Company and offered $15m to buy it when it last changed hands. The Greens: In addition to agreeing with the need for interim heritage controls, we will also actively lobby developers to retain heritage fabric even if not protected in the scheme. Melbourne Voice: Yes of course, Corporate Social Responsibility is not just a 3-letter acronym. If developers and businesses want to enjoy the benefits of Melbourne, they must also understand our Heritage and respect it, protect it and be part of it. The Palace Theatre is a place of great heritage significance, where the decorative interiors were stripped while Council was considering heritage listing of the building and the interior in 2014. Do you think an intact Palace Theatre would have been of greater value to Melbourne, and that Council could have acted faster to prevent the loss of the interiors ? The Greens: Yes. The Greens successfully moved a motion to commission a planning scheme amendment to create a site-specific heritage overlay for the Palace Theatre, with a statement of significance describing the exterior and interior significance of the building. This motion was moved at the first available opportunity once the Heritage Council’s conclusions were reported to Councillors. This reporting process, however, was slow and deeply flawed, and the Council therefore acted too slowly. In truth, the Council should have identified the Palace Theatre as an individual site of significance decades ago. Nevertheless, with the only opportunity available to us, Greens Councillors pushed as quickly and strongly as possible for heritage protection of the Palace Theatre. The Heritage Agenda: Forget should have. The building is still standing. Interiors can be restored, and this interior is pretty thoroughly documented. Council still has the opportunity to act in seeking to coordinate with state government to have the venue become melbourne’s rock hall of fame. Melbourne Voice: Yes. It’s this kind of hindsight that we should prevent. I have heard many councillors say that they wished they did things faster before it was gone, and that Council should have done something a long time ago. So to the existing Council, why didn’t you? Perhaps there is a remedy that the new council can seek. Major changes are planned to be undertaken at and around the Queen Victoria Market by Council. These include upgrading the services in the sheds, working with developers on creating new buildings at two sites, including two high rise towers, turning the carpark into a plaza, and changing the market mix. MHA is concerned about the loss of heritage buildings around the market, the visual impact of tall buildings, and whether the market itself will become more a place for tourists, and less a place for fresh food. What do you think of the proposed changes ? Phil Cleary Means Business: We oppose them. Council’s business case is based on diversifying and changing land use of the QVM site, and this should not be meddled with. 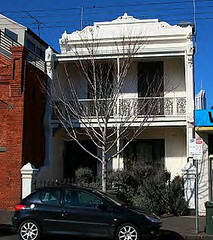 Not only are the QVM buildings heritage, so is the Market’s continued operation as a Victorian-era market. Any upgrades should be handled sensitively so as not to disrupt the fragility of this icon. The renewal is overkill. Stephen Mayne: I support them but we obviously need to get a permit from Heritage Victoria before we can do anything and that is appropriate. 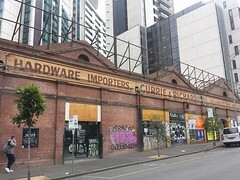 The Greens: Advocacy from Melbourne Heritage Action and The Greens has ensured that the warehouse at the rear of 128-130 Franklin Street was inserted into the heritage inventory as part of the City North heritage review. We are confident that designs for the Munro site will include full retention of this building. Changed the implementation plan to ensure that the sale of fresh fruit and vegetables continues in the H and I sheds post-renewal. Ensured that the market is rezoned to ‘public use zone’ rather than the highly problematic ‘Capital City Zone’, to ensure its purpose and recognition is enshrined in the planning scheme. Required that a solid case be made regarding the need and extent of underground construction – a case which simply has not been made yet. We have ensured that Council will consider this matter as a standalone decision only after the case has been made and Heritage Victoria has scrutinised the proposals thoroughly, in the interests of transparency and in the interests of ensuring that the magnificent heritage sheds are not compromised. Ensured that no construction occurs in the vicinity of the Aboriginal section of the old cemetery. Any development on the periphery of the market – at the Munro or Franklin St sites – must be of the highest quality. We have worked hard to avoid there being any tower above the Mercat Cross Hotel; higher built form is envisaged closer to Elizabeth Street instead (noting the 100m discretionary height limit that has been applied). There is still a very long way to go on the Queen Victoria Market renewal process. Though The Greens were not the proponents of the renewal, we have worked hard and been effective in ensuring that the heritage, character and purpose of Melbourne’s unique inner city market is kept. The Heritage Agenda: Any significant degree of demolition on the munro site is unacceptable. A tower above 100m on the munro site is unacceptable the work proposed to be performed heritage sheds would require approval from heritage victoria before we committed to agree to any such work. Any significant change to the trader profile of the market would be viewed with concern, the small business profile of the traders is one of the market’s unique selling points. Light on the Hill: The Market needs to undergo a heritage assessment including a statement of significance. It should also be subject to a Heritage development plan that encompasses the site and surrounding. Any changes should conform to the standards and policy of ICOMOS and have minimal to no impact on the heritage value of the site. Melbourne Voice: The proposed changes need to be vetted through proper community (wider-Melbourne) consultation. To replace iconic heritage shops and the market feel, with tall buildings ala shopping malls would be a net loss to heritage and a loss to the local community. Council has agreed to appoint a Heritage Planner, though this has not yet eventuated.Would you support the establishment of a dedicated heritage unit or steering committee within the City of Melbourne to guide the management of heritage issues ? Phil Cleary Means Business: Yes, we can see a role for such a unit that would complement the current functions of Heritage Victoria and the heritage planning officer and potentially enable the City of Melbourne to be more proactive and quicker off the mark on heritage issues. Stephen Mayne: Would need to understand how this would work with Heritage Victoria and our existing planning department. The Greens: Yes. Please note that the appointment of a heritage planner in the Urban Strategies branch follows Greens Councillor advocacy and the 2016-17 budget approvals process. The Heritage Agenda: Yes. We would seek/lobby to actively ensure this occurs. Light on the Hill: All Planning staff should undergoes education and training in Heritage protection. Committees should consist of independent expert advisors. Council should consider issues where there is disagreement or divergence of opinion by Council Staff and the advisory committees. Do you think Council could do more to promote the importance of heritage to the public and developers ? Stephen Mayne: Yes, more heritage walking tours should be taken (including by councillors) and we should have a better online presentation of our great heritage buildings. The Greens: Yes. The Heritage Strategy 2013 must be fully implemented to meet this end. Together Melbourne: yes – however the form this takes on needs to be different from Heritage Victoria’s approach. Maybe an education and appreciation approach for public education? The Heritage Agenda: Could, yes. At an administrative level. Realistically this isn’t council’s political role though. This is the National Trust’s responsibility. Melbourne Voice: Yes. Promote the importance but also build a link between the community, the developers and the heritage such that all parties understand the importance and that they are in it together. The previous Planning Minister Mathew Guy described some modernist buildings as ‘ugly’, such as the Hoyts Cinema Centre tower, and delayed protection for seven post war modernist places recommended in the 2012 C186 amendment. The current Planning Minister recently finally granted interim protection for these places. What is your view on the heritage value of significant modernist architecture? Phil Cleary Means Business: Significant modernist architecture is as worthy of protection as any other era’s architecture. Stephen Mayne: Depends on the building – I don’t support retaining that brutalist car park in China town but others have more merit. The Greens: Significant modernist architecture carries high heritage value, and must not be seen to be less significant because it is not as old as other heritage buildings; such an attitude will only make modernist buildings more scarce and our human and built histories less recognised in future. Matthew Guy was wrong to separate C186 into two parts. The Greens motion to call on Richard Wynne to immediately gazette C186 Part 2 was successful; this had dropped off the agenda with the change of State Government, and the Greens, building off the advocacy of Melbourne Heritage Action, succeeded in getting it back on the agenda. Together Melbourne: The issue here is Significant Modernist Architecture – which not all modernist buildings in Melbourne are. We have a lot of very poor examples which do not deserve protection, and some significant modernist buildings do not provide a significant streetscape contributions and detract from the city’s grid. As with other buildings of Historic Significance, we would need to look at all the reasons when assessing a building for protection, or not. The Heritage Agenda: You will find us on public record in several forums supporting all of the c186 amendments, most particularly the controversial former Commonwealth bank corner of Elizabeth and Franklin. Hoyts cinema centre is a beautiful piece of architecture, and the proposal to add extra floors would have completely compromised the building. But we do need to get to the bottom of why the minister thinks interim listing for these is OK but not West Melbourne. Light on the Hill: All buildings nominated and listed on the heritage registers should include statements of significance this includes modern architecture. Melbourne Voice: It’s a case by case situation and this is where a broad community involvement in such matters would help shape Melbourne’s heritage future. The City North Heritage Review also recently gave protection to a post-modern apartment building built in the 1990s. Do you believe that outstanding architecture of the 1980s and early 1990s is worthy of protection ? Stephen Mayne: Yes. Great architecture should be preserved not matter how old it is. Save the Adelphi Pool! Preserve the Republic Tower! The Heritage Agenda: Outstanding architecture is worthy of protection even if it’s only five minutes old. I’m on fairly good public record with this body that i would have listed for example Collins Place twenty years ago, and it’s already been severely compromised. That taught me the lesson. Buildings worthy of listing are often compromised by steady degrees in the decades after their construction. We need a better process for contemporaneously listing significant works. Melbourne Voice: Yes. Architecture of any era that has contemporary significance should be protected. Many of Melbourne’s quirky bars and cafes, creative industries, start-ups, NGO’s, and art spaces that make the CBD such a unique place occupy cheaper spaces in the many smaller heritage buildings, and some larger ones such as the historic Nicholas Building, described as a ‘vertical lane’. Such places are facing increasing rent pressure, threatening the vitality of the central city. Do you think Council should investigate mechanisms to protect such cheaper spaces ? Stephen Mayne: We should directly subsidise some create hubs as has occurred on Sturt Street but I don’t a general rate discount for tenants of heritage buildings. The Greens: Yes. Please see the Arts Infrastructure Framework recently adopted by Council under Cr Leppert’s Arts Portfolio which seeks to introduce planning mechanisms to provide affordable creative spaces. A recent Age article also highlighted the 70% rental increase forcing Bernard’s Magic Store out of their historic Elizabeth Street space after almost 70 years of business. Do you think there is anything Council can do to protect such specialised business ? Phil Cleary Means Business: Yes. We would like to explore the idea of heritage business grants for longstanding, iconic businesses that come under threat due to the city’s prosperity, but are part of the fabric and history of the city. Various levels of government give grants to businesses for many other reasons. Such heritage business grants would obviously need very strict guidelines for both operator and landlord to ensure the system was not exploited. The Greens: Council does not have the ability to regulate private rents. As such, Council’s role is limited to identifying and promoting such specialised businesses; we can and should be continually reviewing our marketing strategy and practices to ensure that unique businesses are identified and promoted. Together Melbourne: As mentioned above; I’m not sure that council has a role in regulating rents. However, this magic shop could go into a creative hub sponsored by council. Light on the Hill: I would have loved to have seen Coles ‘Funny Picture’ arcade protected and retained. I am not sure we can extend this to a business unless there is a business case to be made. Melbourne Voice: Council can’t police commercial spaces and their rent. There are ways that business can survive and Councils can assist through better foot-traffic / community involvement and awareness of these iconic businesses. The 2012 heritage strategy recommend looking at ways of increasing the impact of the Melbourne Heritage Restoration Fund, nothing has eventuated. Ideas such as simply adding more money to the fund or providing rate relief in return for owners repairing and restoring buildings have not been considered. Do you think that more should be done to provide monetary incentive to owners of heritage buildings? Phil Cleary Means Business: Yes. Council needs to incentivise heritage owners to do heritage repair and restoration. Processes for this should be simple for owners in order to encourage such works. Stephen Mayne: Yes, we don’t do enough with rate rebates to send price signals and incentives and discounts for heritage owners who invest in preservation should definitely be looked at. The Greens: Yes. The Greens secured in the 2015-16 Annual Plan the action to “investigate mechanisms to provide financial or other incentives for property owners to preserve heritage.” Unfortunately with the rapid changeover of management in the strategic planning work areas, this action was deferred. With the significant increase in staff in the Urban Strategies branch now being recruited, it is time to make this action and the consideration of a robust and prominent restoration fund and funding mechanisms a high priority. Together Melbourne: yes, and maybe it can also be tied into a fund to assist building owners to retrofit heritage buildings to achieve much more sustainable energy usage options – there may be trade-offs with reduced energy costs and the cost of restoration. Notions of Heritage and Sustainability have arguments and design aspects in common. The Heritage Agenda: Yes. We have specifically considered this in the context of our policy of returning replica Victorian awnings to appropriate buildings on Swanston and Elizabeth. Council would administer the scheme and bear all costs related to the operation. Council also needs to do more to actually promote the Melbourne Heritage Restoration Fund, as no business owners I have spoken to know it exists. Melbourne Voice: Yes. Owners of heritage buildings ought to have some tax-break/rate-break above and beyond the everyday deduction for capital repairs / improvement. Other incentives could also be useful. Do you envisage your term as a Councillor having any impact on heritage protection in the CBD ? Phil Cleary Means Business: Yes. The impetus for our team to run was to protect the QVM from inappropriate development. Prosperity means development, but it should be good, creative development that respects and works with Melbourne’s heritage, not lazy, greedy development that works against it. Stephen Mayne: Greens Councillor Rohan Leppert has been the prime driver of this and I admire his intellect and work and will generally support his proposals, subject to officer view and the thoughts of colleagues. The Greens: The Greens Councillors have successfully secured dozens of Council resolutions and Annual Plan actions in heritage. We have been the leaders on heritage protection in this term of Council. The Hoddle Grid, Southbank, Palace Theatre, Bourke Hill, Guildford/Hardware Lane heritage reviews and Kensington heritage review expansion would simply not have occurred without Greens Councillor motions and advocacy. While some other Councillors have been advocates for heritage protection, and this collaboration has been essential to improving heritage protection, it is also clear that in this term only the Greens have been successful in moving motions on notice related to heritage that have measurably improved the way the City of Melbourne has undertaken its work in this space. The City of Melbourne is now in the midst of completing more heritage studies and statutory reviews than has occurred in more than a generation. This is due to consistent and determined Greens Councillor advocacy. I would always take the Planning offices advice seriously – and their Heritage advice with careful consideration. The Heritage Agenda: You better believe it. We are branded “The Heritage Agenda”. If we don’t deliver significantly on that front, we have no basis to ever ask for re-election. Melbourne Voice: Absolutely. One of the Melburnian Voice pillars is “preserving our culture and heritage”. When elected, this is an action, not a throw away statement. Missing from the responses is a photograph of the proposed Goodrest Development on Toorak Road West South Yarra. This photograph shows the extent of the impact of the underground car park will have on the frontage of the Goodrest site. Goodrest is listed as a site of state significance and has a A Grade Heritage listing.